Sadgill Epic, Sadgill, nr Kendal - Cumbrian Trail Guides - Mountain Bike Cumbria - beautiful trails and information from throughout the Lake District and beyond! Please use Ordnance Survey OL7 to guide you as this route description does not include a map. Energy drink is a must and a Helmet is a requirement! View 66 photos of the route. Driving from Kendal, take the A6 towards Shap, but turn off to go down to Garnett Bridge. Follow this road for a few miles. You come to a left turn over a humped-back bridge. Stop before the bridge. This it where you should park, please do not block the track, the local farm will not like that. At first this part of the trail is reasonably flat, with the odd rock outcrop or stream crossing but as you get further up it gets steeper. Within the last kilometre it gets more rocky, some of this is rideable. Also adding to the fun on the ascent are large cobbles, which are rideable, it's a steep challenge and one to ride if you like climbing! Once you are at the top of this climb it flattens out for a while. Make sure you carry straight on, there is a sign post to guide you! This downhill is almost rideable, there are plenty of switch backs and plenty of small drop offs. You need to watch out for wheel sized gaps when you are going downhill so you don't go over the bars. Once you get down to the first gate it gets easier from there on and you can go at some pace to the car park at Mardale Head / Haweswater Reservoir. Haweswater is a reservoir in the English Lake District built in the valley of Mardale in the county of Cumbria. The controversial construction of the Haweswater dam was started in 1929 after Parliament passed an Act giving Manchester Corporation permission to build the reservoir to supply water for the urban conurbations of north-west England. This is the steepest section of the trail and is a bridleway, but feels like you are rock climbing. It also looks like something out of 'Lord of the Rings', but don't let that scare you. Be prepared to either lift your bike over your back and run up the hill, or take a picnic - this ascent could take some time. You can take a well deserved break at Small Water and at the top, you will want two (probably more) of them. This section of the trail is technical, the first part being the most challenging, consisting of small switch backs and general steep terrain. It then begins to level off, but you will still need keep your technical skills up as there are plenty of rocks to fly over and rocks to get in your way. If you are good enough you can get up some speed. Knowing how to bunny hop properly (front first, back following) then you will find this more fun! When you are nearing the base of the valley you will find it gets easier and you can give your brakes a rest and fly down the tracks to Hallow Bank. At Hallow Bank you need to follow the correct directions to get to Longsleddale. You will come to a set of metal gates, When you are though the second one, you need to follow the sign down the grass to the gate. Once through the gate, follow the road/track left up until you get to another gate, which will bring to a T-junction. Follow the road to the right up the hill until the next track on the Left, this is the track over Longsleddale. Now you have travelled over the steep and technical, this is a chance to ride over something easier. And you will want it to be easy after what you have just done. This climb is easy and once you get to the top it's down most of the way back to your car. An amazing route, albeit a challenge of a very vertical nature... I loved every mile and can remember the route by the scars on my shins and ankles. Nice work, James! Everyone I have spoken too that has ridden this route says 'It's fantastic!' so much so, I might have to ride it again! Took this one on during a very dry, hot spell last year. Didn't take enough sun-cream! The trail down from nan-bield passing the reservoir is just the business. The top section is balancy and quite technical but do look out for the rock drop just as you start "letting go". Definitely got "re-ride" written all over it! Ahh... that rock drop - the cause of so much fun! If you like these then head out to the Howgills, there are loads of them out there! Sorry I have to disagree. The route is great before and after Nan Bield pass. This section has to be one of the most demoralising sections of trail i have ever ridden up! Or should i say pushed/dragged up etc. Yes the downhill from the top is good but if you really want to try the downhill section, ride up from hollow bank don't waste your time with Nan Bield pass unless your into extreme hike a bike! Two words: Never Again!Epic = PushSorry, I'm either too unfit, cowardly, technically deficient or a combination of any of the previous to have enjoyed this. 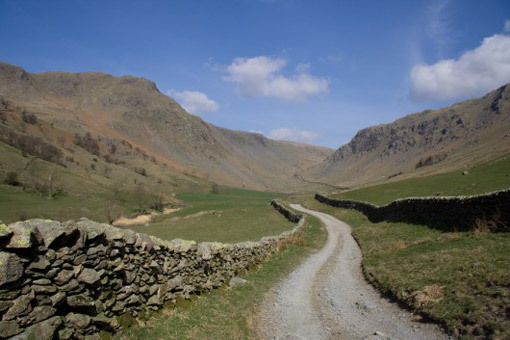 Did anyone really ride those switchbacks at the top and if so can I come out with you for a day for a few pointers, I must be crap!In all seriousness the ride down to Mardale Head is great and after the first third of the Kentmere descent I got into my rhythm and enjoyed my riding. The descent back into Longsleddle is great fun too. It's just the torture as you carry, push, kick, scream, cry your way up the Nan Bield Pass that makes no sense. I totally agree with Stuart above me, do any of the parts in isolation but avoid the pass up from Haweswater at all costs. Did this last year. Bike carrying technique needs to be up to scratch for this one. Highlight for me was saying hello to the half dozen beer bellied 4x4 dudes as I lifted my bike over locked gate on the way up to Gatescarth Pass, did they have some tricky reversing to do! Difficult / Feels like an Epic! This trail has been viewed 50124 times!